The ongoing plight of the Hadzabe in Tanzania has caught the attention of the British mainstream press, in the guise of this article from the Daily Mail, on whose behalf Andrew Malone has filed a report. Although many readers of these pages will already be familiar with this story, it’s important to keep it in the public eye, hence this post. After a four-day quest covering thousands of miles by light aircraft, Land Rover and, finally, on foot, we knew we were on the brink of an unforgettable experience — the chance to reach back in time and meet our living human ancestors from countless millennia ago. We waited in silence. Suddenly, shadows of human forms started moving around the bush. The noise of sing-song voices floated towards us. Here, in one of the world’s last untouched wildernesses — the dense bush south of Africa’s Rift Valley where the first humans emerged upright more than two million years ago — a group of men from the mysterious Stone Age tribe were ready to make their introductions. Draped in animal skins and carrying arrows tipped with poison, two slim, wiry characters walked slowly towards us in the clearing. Time has stood still for these men — two of an estimated 400 remaining survivors of the Hadzabe tribe — whose way of life has scarcely changed since human evolution began. More than wild animals or sleeping sickness, what Gonga fears is that rich men with guns and helicopters from the ‘new world’ are about to arrive on his doorstep, spelling the end for a tribe that, with the exception of headhunters in remote parts of Papua New Guinea, represent the only bridge between modern and ancient man. It is the modern story — of clashes between people from the first world eager to exploit Africa, whatever the cost to ancient customs, and the desperate battle by the world’s few remaining indigenous people to survive. In the past, it has been Europeans who have most noticeably exploited Africa for materials and humans, seemingly oblivious to what they were destroying in the process, but more recently other foreigners have been turning their baleful eyes towards this continent, including China and the Middle East. And while of course it could be argued that the First World has since made reparation in financial and material terms, the reality for hundreds of millions of people there has remained one of unremitting poverty. If the Abu Dhabi royals had overflown Native American territories, or Aborigine grounds in Australia, and then proposed they boot some of them off their land in order to better enjoy their hunting trips, there would be immediate uproar, and no such deal could be made. This might be because both these nations are First World, who happen to have a remnant of their own ancestral heritage living in their nation. Forgetting for a moment the disgraceful ways in which those native populations were treated, the situation today is that they are legally more secure, and as far as I can work out, have sufficient rights to ensure that no-one can take their lands away from them, or at least not as easily as appears to be the case here. In return for the dubious pleasure of shooting lion, leopard, buffalo and elephant, Crown Prince Hamdan bin Zayed (the UAE’s deputy prime minister) and Crown Prince Mohammed bin Zayed (deputy supreme commander of the air force) want the Hadza evicted from the area to prevent them competing for game. As bait, they are offering to pay the impoverished East African country a reported £30million, and have offered to build private homes, hospitals and schools for the displaced tribe. The Tanzanian government supports the plan and, for years, has considered the Hadzabe an embarrassment — ‘a backward people who should be living decently in proper houses’. Without help, there will be no shadows in the bush for much longer. Matayo and his brother and sisters may be the last Hadza children to dance round the fire in the deep of the African night. Soon, there may be only ghosts in the Yaida Valley, and a unique way of life will be replaced for ever by the sound of guns bought with Arab gold. n.b. for further articles on this site, just type Hadzabe into the search box, which should point you towards them. Thanks for continuing to keep this topic in our minds and thoughts, Tim. This is a serious issue confronting anthropology currently and this is one of the times where I wish the community would keep talking about this. “Yet there is no place for sentiment in the natural world. As Gonga instinctively knows, the weak seldom survive in Africa. “If any one species does not become modified and improved in a corresponding degree with its competitors, it will soon be exterminated,” wrote Charles Darwin in The Origin Of Species, under the heading Natural Selection. This is not a case of survival of the fittest, at all. The Hadza are very fit to live in Africa. They are actually very good at it. This will not help out the Hadza at all, nor will it help out Tanzania. I don’t need to rehash the cultural sanctity argument. Tanzania will lose an important culture, damage its ecology, and really make itself a sellout to us outsiders. There are some interesting discussions brewing up. There’s a new Yahoo Group about this, with a whole lotta links to other news sources covering this topic. It maybe a good idea to join up with them. Also, the discussion brewing at the bottom of the Daily Mail is also very interesting and stimulating. 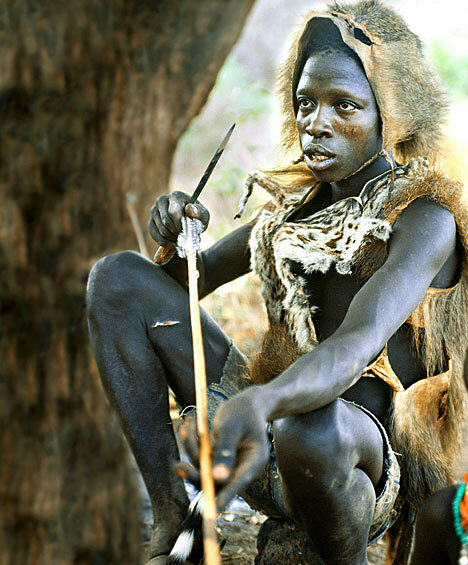 It is very interesting to see the world alarming for the displacement of Hadza tribe as if they are the useless animals in the bush who need to be hunted to reduce its population. Hadza community is as any other community that requires all services from the government, NGO’s, Institutions and Individuals.They need ownership of their land just like us,need to be involved in the day to day development practices of their land like anyother community. The overall process of taking up the hadza community land has been full of corruption, untransparent and comfisticative that infringe the lives of hadza community.The Hadza population is numbering down every morning and evening.They live in ecosystem systems while we others are living in a destructive manner. We do destruct the environment we live in,the environment that support our living but no any self/personal traditional way we do to save our environment. Actually , I am very disturbed personally by the so called UAE safaris to hunt in the hadza area.What I do ask myself everyday about the hadza land and hunting processes that are been planned is, Does our government care about us as communities or they just look for their interests? Does the government talk or plan for good governance and transparence deep from their heart or its just the way of taking big shares from many to few?Is this the way of investment processes taken by other countries or its ours only in Tanzania? Do Tanzania Government care more of cash that goes to private individuals than its community,the community that vote for their government? It is so amazing to see such a very blind minds of our planning system and the overall procedures taken by our government without considering the community. What I would like to advice is that,the government should have to review its decisions and do it in aparticipatory manner.No one is claiming for the investments/privatization but what we are alarming of is the process and procedures taken as if the area is open land with no person living in their.Let them consider the Hadza community as people with minds and ability to decide on what to do for their land.Let them be included in decision processes especially that either positively or negatively affect affects them. Emmanuel, thanks for your comment. I appreciate that you took the time to express your thoughts and ask poignant questions. In the future please spell check and format your sentences correctly, i.e. put a space after commas and periods. I don’t mean to be a big bore, but it becomes really annoying to read an otherwise intelligent comment that’s bogged down with formatting inconsistencies. I’m afraid that is the way of the world. It’s possibly always been like that but with greater firepower the effect now is greater. I’m not saying for a moment that I approve. I’m sorry if I come off defensive in the following comment but I have a lot of beef with people who fall back on the social darwinistic crutch in these situations. I know you don’t approve, but by saying that this ‘is the way the world is’ is basically an excuse. It shows one is quick to give up and how easy it is to fail to stand up and fight for the Hadza’s rights to live how they want to. Sure, the social environment is changing in Tanzania… But the ecology isn’t. Ecologically speaking, the Hadza are very capable to continue to survive. They are not currently able to survive in the global socioeconomic environment, as evident by their inability to sway the UAE offer to by out their land. Does that mean we should give up and let the deal go thru? Does that mean that is how the world is and they are not deserving to live the way they choose to? No! In times like these, people help one another out and spread awareness about injustice happening. The social world is not fixed in the survival of the fittest mode that controls much of the natural world. Often people group together to help one another out and overcome adverse conditions. Kambiz you write: “Often people group together to help one another out and overcome adverse conditions.” I agree totally. I didn’t say I approve of what’s happening!